Maia is quiet on the drive home. She can feel her tiny, claustrophobic world blowing wide open, all the possibility rushing in like a rising tide. The world is so much bigger than she had ever guessed; all these people in it, like Cass, like Todd, making their own decisions for themselves. She cannot imagine Cass ever doing anything she does not want to do, ever being told where to go or what to believe. Maia has been trapped for so long, surrounded by people who are as bound as she is—her father, Oscar. Who knows, maybe even her mother, stuck in a marriage she does not want, a house she cannot ever clean into a place she actually wants to be, a defective daughter she paid for and cannot return. Maia thought piano was her only path out; she’d never even imagined so many other roads existed. Maia is a talented pianist whose course in life seems to be set: she loves the piano, but she also pursues it because it’s the only escape from her parents’ house and rigid rules she can imagine. But her life changes when one day, on her way back from her piano lesson with Oscar, she happens to meet Cass. Cass, a teenage runaway, is not the sort of friend Maia’s mother would approve of; but the two soon fall for each other, and one day they decide to take off in Maia’s parents’ car. Cass shows Maia that “the world is so much bigger than she had ever guessed”, and for a while the two lead a carefree, idyllic life. But a gig in LA introduces unexpected complicating factors into their private world, and almost before they know it things begin to change irrevocably. 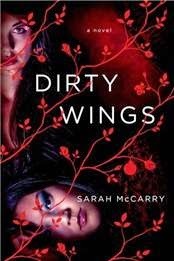 Dirty Wings is a prequel to Sarah McCarry’s previous novel, the fabulous All Our Pretty Songs. It’s set about eighteen years before, and the protagonists, Maia and Cass, will be known to readers as the mothers of the main characters in All Our Pretty Songs. Like its predecessor, Dirty Wings is a loose retelling of a Greek myth — this time the story of Persephone, which unfolds slowly and heartbreakingly amidst piano recitals, rock and roll gigs, band rehearsals, and two girls following their hearts and attempting to forge their own paths. I’ve been following Sarah McCarry’s writing online for years, and to be honest I was slightly in awe of it long before I ever got my hands on her fiction. I didn’t do anywhere near enough shouting from the rooftops about how wonderful All Our Pretty Songs is, I don’t think, and I regret that to this day. Allow me, then, to use this as an opportunity to make up for lost time: these novels are wonderful and you should read them as soon as possible. 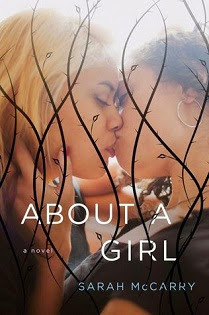 In my Year in Review post for 2013, I summed up McCarry’s first novel as follows: “Orpheus and Eurydice, rock and roll music, strong emotional ties between girls, an unapologetic portrayal of female desire, and gorgeous, gorgeous prose”. The myth is different for Dirty Wings, but other than that it still very much applies. In case you’re wondering about reading order, I think you could probably start anywhere, though Dirty Wings will probably have more emotional resonance if you’re familiar with All Our Pretty Songs. Then again, the reverse is also true: I had to go reread the Cass and Maia scenes in AOPS when I was done with Dirty Wings, and wow, they cut like a knife. (Some mild spoilers from this point onwards.) I read Cass and Maia’s story as a romance — there’s longing and love and an interrupted kiss that might have set a different course for their lives. The bond they share is still blurry and undefined, but despite my belief in the importance of unambiguous lgbtq representation, I thought this felt right for this particular story, for much the same reasons why it felt right in the early issues of Strangers in Paradise. Also, it’s important to note that as much as the two hesitate over words and actions, their love is loud and clear and very much the emotional core of the novel. Maia and Cass’ story doesn’t have a happy ending, as readers of All Our Pretty Songs will well know. My heart broke for Maia again and again, but I can’t really imagine respecting her right to be a free human being and still wishing she had stayed at home and followed the trajectory her parents had set for her. She needed to explore all those previously unimagined possibilities that were suddenly before her; she needed her choices to be unequivocally her own. The freedom to make decisions that might not turn out as you wish is part of what it means to be human. It’s a freedom girls everywhere deserve; a freedom they should be able to take for granted because it comes as easily as breathing. It takes a lot to break free from the years of conditioning that tell you your priority ought to be to please other people — Maia achieved that much, and that’s valuable in its own right. I find myself thinking, again and again, about the one choice Cass and Maia couldn’t bring themselves to make, and about the possible reasons why they found it so hard to choose each other. This is where I shamelessly take advantage of my blog’s “reading journal” subtitle and go on a long tangent about loving girls. But first, I want to make it clear that I’m aware that reading Dirty Wings as a romance is not inconsequential: I’m your run-of-the-mill straight lady; I can’t pretend to know what it’s like to be a teen falling in love with another girl today, let alone twenty years ago. Still, there was something to Cass and Maia’s story that spoke to me, and I find that worth examining in a bit more detail. Stories help us make sense of ourselves and organise our experiences, and I felt this especially acutely when I was a teenager. There was a lot I hadn’t yet encountered, and it was easy to feel lost without a narrative grid to guide me. Also, the world was, as it still is, an inescapable bog of misogyny; this was the backdrop against which I tried to make sense of my experiences. Everywhere I looked, there were stories and cultural narratives that told me emotional ties with boys were more real and more important than ones forged with other girls. It took me far longer than I wish it had to break free of that. It wasn’t the fact that the girls I was friends with were important to me that I struggled with, exactly; that much was obvious, and it was culturally sanctioned, at least at a superficial level. But the practical ramifications of this importance were knottier. Every time a girl hurt me, the feeling was tinged with a sense of resentment and wrongness it took me years to make sense of, let alone break free from. Unlike in straight romance, there were no glamorous undertones to the emotional labour that went into ironing out bumps in these relationship, into strengthening ties, into improving communication, into growing closer step by tiny step. There was no “it hurts because it matters” narrative to peg these experiences onto. There was just exasperation, mild bewilderment at the fact that these feelings were more central to my life than in any story I’d encountered, and a million poisonous narratives to battle about girls backstabbing one another. The hurt, the fear, and the vulnerability I experienced with other girls were not acknowledged in any stories I knew; the joys were never celebrated. The emotional energy I poured into my relationships with them was never portrayed as exciting and worthwhile. Either friendship was a smooth ride all the way (and what form of human closeness is?) or we were told we were embodying stereotypes and proving to the world that girls don’t “really” get along. Feminism would have made a difference, of course, but feminism was years away. We weren’t supposed to love other girls; not really. For all the lip service the magazines I read paid to the idea of teen BFFs, we were, at best, supposed to form superficial strategic alliances that would break down the moment something more real — a boy — came into the picture. I think this is not unlike the context in which Maia discounts what she and Cass share, and convinces herself it can’t possibly take priority over a pretty boy with a guitar. I’ve seen plenty of stories that examine how our definition of masculinity gets in the way of intimacy between men (this is, just to give you one example, why I love the film Y Tu Mamá También), but I’d never seen such an expert examination of how a social context full of misogyny can blindside girls, cause them to doubt their own hearts, and rob them of the glorious road trip into the sunset together they so clearly deserve. I wish I’d had this book fifteen years ago. The next morning she gets in the van with them. Percy and Byron still aren’t speaking to her, and she knows without having to ask that they think bringing her along is a terrible idea. She wonders what they think of her; some “Chopsticks”-playing parlor trickster whose greatest accomplishment is banging out “Happy Birthday” from memory at some all-girl slumber party? She stares out the window, wondering if she’ll ever find another world besides Oscar’s where anyone takes her seriously. If this is what it is to be a girl, she’s no longer sorry she’s missed out. I couldn't agree more with what you said about female friendships! When I think of all the girlfriends I've lost throughout childhood because of misunderstandings and miscommunication and not understanding or having the emotional capacity to put those relationships back together at such a young age, my heart absolutely breaks. My library didn't have the first book but I did put Dirty Wings on hold! Looking forward to reading it - thanks for the recommendation. I stopped reading at the spoilery section and am now heading off to add these to my Xmas list. I may have to flip a coin to decide the order of reading; the decision will haunt me. I’ve seen plenty of stories that examine how our definition of masculinity gets in the way of intimacy between men (this is, just to give you one example, why I love the film Y Tu Mamá También), but I’d never seen such an expert examination of how a social context full of misogyny can blindside girls, cause them to doubt their own hearts, and rob them of the glorious road trip into the sunset together they so clearly deserve. This. A thousand times this. Friendship is just as important, if not often more important, than romance, and the way we treat friendship—especially friendship between women—as either disposable or inherently antagonistic—is a huge disservice to young people learning those narratives. Well, you know I am with you on how wrong-headed it is for our culture to portray friendship as secondary and less important to romantic relationships. They're both important, for sure, but when I'm in a new place, it's establishing friendships that I prioritize. Friendships make a net of social support; it's so crucial to human happiness to have strong, trusting friendships, and we soooo deprioritize the importance of that. ANYWAY, I remember thinking that All Our Pretty Songs sounded great when you raved about it last year, and my library didn't have it then, and that remains true. But it does have Dirty Wings, apparently, so I'll have to read that one (first). Just stopping by to say that I can't agree more with your thoughts on female friendship, society's ideas of masculinity and (maybe especially) Y Tu Mamá También. Wonderful post!